Located in Phuthaditjhaba in South Africa, the Charles Mopeli is a grass-surfaced stadium mostly used for soccer matches. Currently, the stadium can accommodate a crowd or 35,000 and is used by both the African Warriors and the Free State Stars. The Charles Mopeli Stadium is one of the main places in Phuthaditjhaba to visit and is most recognized as a non-crowd location offering amazing views, which attracts many international tourists. The great selection of hotels in Phuthaditjhaba near the Charles Mopeli Stadium offers a range of options, starting from 5-star luxury suites to budget-friendly hostels. The area near the stadium also offers plenty of coffee shops and restaurants, while the local street vendors offer quick bites and a variety of interesting dishes. Nearby visitors can also visit the local bars and popular lounges open till late to serve the best homebrews. The Charles Mopeli Stadium is located in Phuthaditjhaba, a small town in the Free State province. The Sesotho name, Phuthaditjaba means the gathering place of the tribes, while the region is called Qwa-Qwa, which actually means whiter than white, the name originated due to the Drakensberg mountain peaks that are frequently covered in snow. The Charles Mopeli Stadium is a must-see for active travellers and backpackers as it is one of the most popular places of interest. Entrance to the stadium, while no matches are played are free and daily visits take place at 01:00. There are also several other attractions in the area which includes the Tugela Falls, Meiringskloof Nature Park, Mosamane Guest Farm, Bethlehem Aerodrome, Sandstone Heritage Trust and the Breakfast Stream. The Tugela Falls is South Africa’s highest waterfall and it is located in the Giants Castle Reserve and has a height of 948 meters. The falls can be visited throughout the year, although it is most striking during the rainy season. The climate in the area is generally warm, with maximum temperatures of 25.6 on average while the minimum temperatures during winter are around 13.1 Celsius. The lowest rainfall occurs during July, which on average is only 9mm, while the average rainfall in February is 141mm. Recently soccer fans marched in protest after two league games including the Santos and Vasco de Gama were played at an alternative stadium. The municipality of Phuthaditjhaba charges R60,000 per game of which an amount of R20,000 if refundable. The teams found the price to be extremely high and arranged for the matches to take place at an alternative stadium. 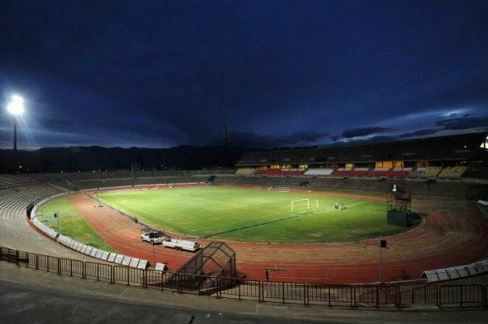 The Charles Mopeli Stadium is mostly used by the PSL club as well as the African Warriors and is owned by the local municipality, Maluti-a-Phofung. The stadium was previously known as the Qwa-Qwa stadium and had only one name changed when it was named after Chief Charles Mopeli.